DataPixel manufactures the OptiScan high speed 3D scanning sensors, providing the best accuracy and sensitivity on the market. 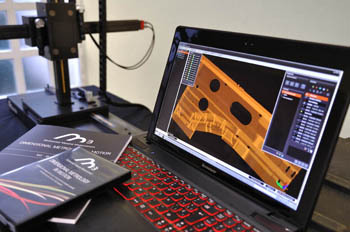 With OptiScan you can obtain high accuracy 3D pointclouds of your products for reverse engineering, virtual metrology, automatic inspection and robot guidance. OptiScan can work on shiny or dark surfaces without the need of spray or coating. Exclusive laser, electronics and optical technology provide the best synchronization to your mover (CMM, CNC machine, Robot, Portable arm), resulting in better accuracy and repeatability. High Resolution sensor for very accurate scanning. All-purpose standard sensor for high speed scanning. Extended distance of working for in-process inspection. Extended field of view for in-process inspection. DataPixel offers two types of controllers for stand-alone or portable applications: HCU-1000 is the standard controller for standard 19-inch industrial racks. HCU-900 is the compact controller specially recommended for portable applications.